Chef Russell Martin of the Grand InterContinental Seoul's Caffé Espresso has put together a selection of six different fresh carpaccio — a delightful choice for both fans and newcomers to this "cold" dish. A traditional Italian favorite, the term "carpaccio" usually refers to thinly sliced raw beef or tune, usually served as an appetizer. Typically the thin slices are served with a dressing of olive oil and lemon juice plus seasoning. 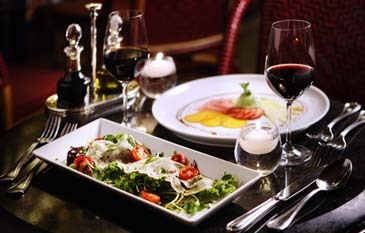 Today carpaccio is used variably and often refers to any very thinly sliced presentation of foods. At Caffé Espresso choose from scallop and mango carpaccio, lemon salad, classic beef carpaccio, with vinaigrette and shaved parmesan or even fruit carpaccio with sweet pesto sorbet to name just a sampling of the selections available.